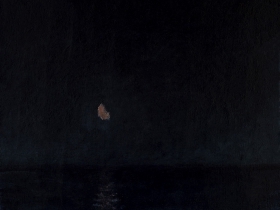 Artist David Niec’s subtle oil paintings capture the moon’s subtle changes. The one object seen by everyone who has vision, from our pre-human ancestors to the Buddha to Jesus, is the moon. We can feel and glimpse the sun, but no other single object has been gazed at more than the moon. But in our busy, screen-filled lives, we’re often so preoccupied that we forget to see it. 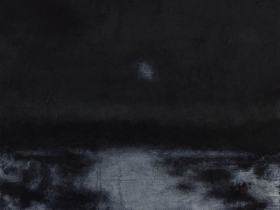 The work of Dave Niec shows it to us through his intense devotion to the night sky in his solo show, “In the Expanse of Nighttime” at The Alice Wilds gallery. 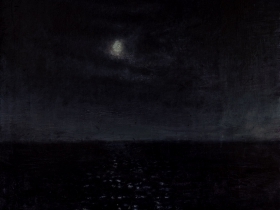 As with the moon in the brightness of day, these paintings tend to disappear in strong light. At the opening reception, it was striking how much the show changed because of the transition from day to night. The Alice Wilds is a large, bright space, but they have thoughtfully painted the two main walls a darker grey, (a color that Niec has been showing his work on for years) and adjusted the gallery and window lighting. When one thinks of nocturnes, darkness naturally comes to mind, but these paintings are full of color and light. Rainbow skies accent large passages of deep blue, the paint layered in thin, semi-transparent glazes that have been built over the months like the moon cycles. Up close, the materiality of the work is apparent, but the drips, scraping and layers merge into atmosphere with just a few steps back. At the edge of many of the paintings, daylight creeps in and if feels like we are with Niec on his daily journey and at the end of the painting session brings the dawn and sleep. Much of the work is done outdoors, in all weather, with the aid of a handheld flashlight on his painting. 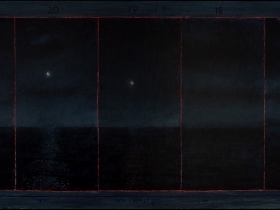 Time and direction are often notated on the painting’s boarders and different lunar phases are delineated by boxes of lava red lines. 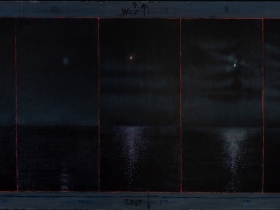 Through this work we get a sense of experiencing this man’s daily relationship with the night sky and its transitions. In each piece, the moon has as much character as a human model and is painted differently depending on the atmosphere. 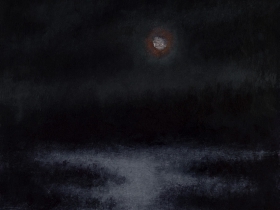 Surrounded by a red halo, muddled by overcast skies or as a waxing crescent, it is painted as a thin stroke of shimmering light yellow or a blob of thick white, its outer skin dried and pushed, creating divots which pick up the subsequent dark glazes, giving it the appearance of a submerged floating orb in a viscous sky. In other pieces, clouds of different shapes and densities float and dance like twilight apparitions. In the back room, along with more smaller paintings, are three small ink drawings which have delicate and gradual transitions of subtle value built with washes overlaying needle thin marks. They, as much as any of the paintings, glow from within. The white of the paper, untouched by ink, shines above a glistening, moon-drenched Lake Michigan. The works in this show are infused with the surroundings from which they came, as if Niec submerged himself in the night and allowed its essence to emanate from his hand onto the panels. Niec’s studio is located above his garage, which is where many of his paintings are completed from memory. He works in oil on masonite panels because of their durability in the elements. During a recent studio visit I noticed that the panels were stacked everywhere, four or five deep. He would remove layer after layer of painting to reveal more work at different stages underneath. As the moon cycles through its changes, so, too, do the paintings. Dave Niec is an alchemist and through the medium of paint and ink, over time, turns his nocturnal visions of Wisconsin skies into gold. 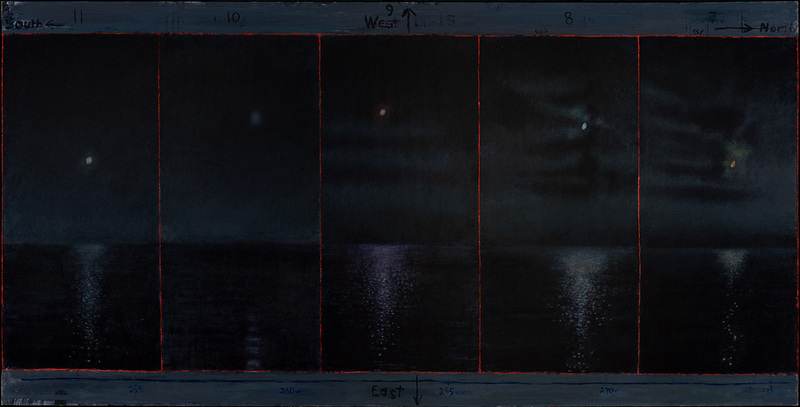 David Niec, “In the Expanse of Nighttime,” is on exhibit at The Alice Wilds gallery, 900 S. 5th St., through November 10.